Graduation Rates: Chicago Says It Will Keep Better Track of At-Risk Students : NPR Ed Chicago Public Schools have been mislabeling dropouts, getting them off the books and out of the graduation rate. CPS now says it will stop the practice. 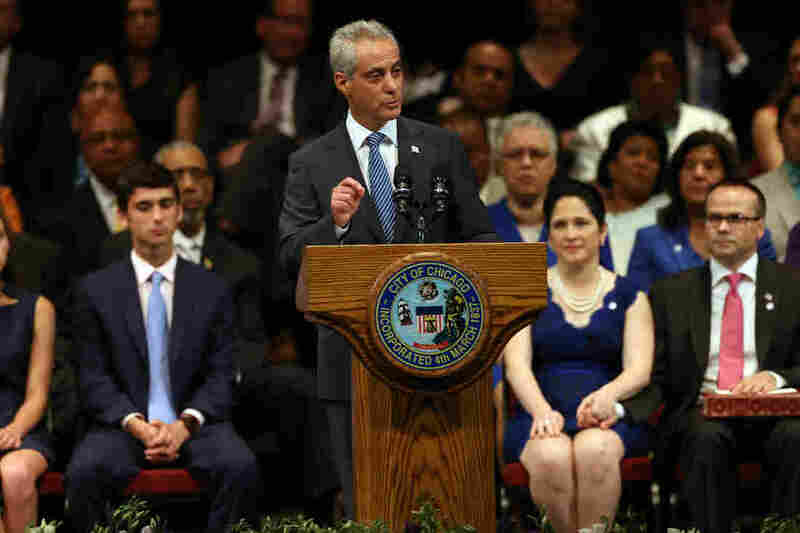 Chicago Mayor Rahm Emanuel focused on disadvantaged youth in Chicago in his inaugural speech after being sworn in to a second term as mayor. We have an update on a story we reported yesterday. The NPR Ed Team's investigation into high school graduation rates found that many states and school districts are using questionable, quick fixes to improve their grad rates. At the top of that list was Chicago. Over the last four years, thousands of dropouts across at least two dozen Chicago high schools never counted against the city's graduation rate: Because the schools mislabeled them as having left the public system. In response to the story, the city now says it's going to crack down. Officials don't dispute the fact that the database is riddled with errors. Still, they say, they will not go back and revise the graduation rates. 1) Require random spot checks of all school transfer data. 2) Make principals sign a document taking full responsibility of making sure transfers are, in fact, real transfers. 3) Require staff to attend trainings. 4) Refer any questionable activity to the Law Department and the district's Office of the Inspector General. "We're going to hopefully determine the extent of the problem and find out just where responsibility lies for those problems," says the district's inspector general, Nicholas Schuler. But that, he says, could take a really long time. Inspector General Schuler was first to look into the problem — focusing on a few schools. "Two high schools had been improperly coding students as transfers to GED programs," says Schuler. Illinois law is clear: Those students should be counted as dropouts. And Schuler found staff doing all of this deliberately. He also wrote in his annual report last January about how large groups of students were listed as "transferred to Mexico" without providing the name or address of any school. And that's exactly what a joint investigation between member station WBEZ and the Better Government Association found, looking through the records of 25 Chicago high schools. At one school, an average of more than 100 students a year supposedly left for "homeschooling." Is that possible? Maybe. But it's a huge outlier. Most high schools listed only a handful of students leaving to be homeschooled each year. The homeschooling label is important because, again, it removes students from a school's graduation rate. John Barker is in charge of accountability at Chicago Public Schools and says he's well aware of the mislabeling. "Yes, we have identified there are some issues with our coding processes," says Barker. "What we need to do is we need to ask some questions. Is that a concern to us? Yes. Are we interested in following up. Yes." Despite these errors, Barker and researchers at the University of Chicago say this shouldn't negate real progress. "There is always doubt about what the exact number is, because there is ambiguity," says Elaine Allensworth, executive director of the university's Consortium on Chicago School Research. "But that doesn't mean the trends in graduation rates aren't real." Mayor Rahm Emanuel's office insists the city's rate is going up no matter what. This story was co-reported with Sarah Karp of the Better Government Association in Chicago. To see the WBEZ and Catalyst Chicago investigation click here.